Spatially related carbon and oxygen isotope spot transects (10 μm) carried out within calcite. The drill core sample is from 730 m depth, Laxemar, SE Sweden. The fracture surface is coated by calcite and pyrite crystals. 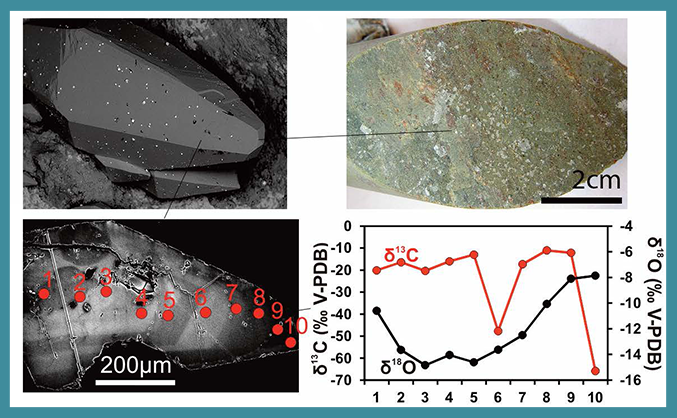 The SIMS analyses within the calcite revealed episodic 13C-depletion, reflecting two separate periods of microbial anaerobic oxidation of methane within the granite fracture system. The Oxygen isotope composition reflects different groundwater origin or temperatures at these events. These measurements were performed on the CAMECA IMS 1280 ion microprobe (NordSIM, Sweden). Earth and Planetary Science Letters, 470, p. 108 -118 (2017). Image submitted by Henrik Drake, Linnaeus University, Sweden.